We are Service Unit 11 in Association 32 aka SU 32-11! We are part of the Girl Scout Council of the Nation's Capital (GSCNC) serving girls in Monocacy, Poolesville, Dickerson, Beallsville and Barnesville, Maryland. While some people still think of us as just cookies, campfires, and friendship bracelets, Girl Scouts are so much more. 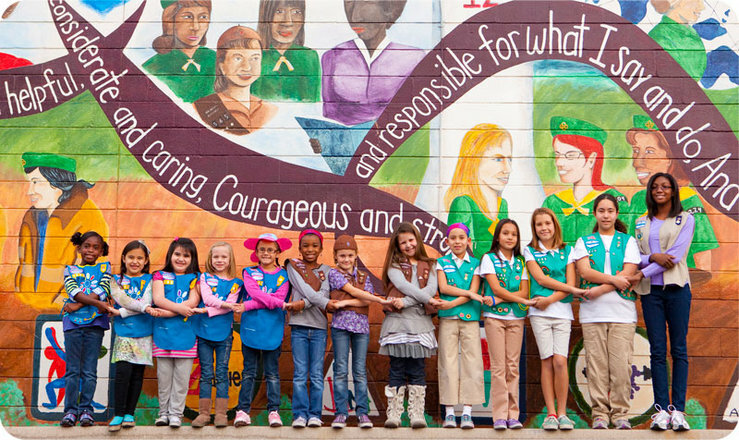 Girl Scouts are big thinkers, groundbreakers, and role models. She’s confident, responsible, and committed to changing the world. Here's proof: Every year, Girl Scouts collectively spend more than 75 million hours improving their communities. These traits define girls of courage, confidence, and character, who make the world a better place. This is the Girl Scout DNA. What are YOU waiting for?! Join today!! Most girls join a local troop or group for fun and friendship, but they also find out about building character and self-esteem and serving their communities — the core qualities of Girl Scouting. In Girl Scouts, girls find a safe place to grow and share new experiences, learn to relate to others, develop values, and contribute to society. It's never too late to join. The Girl Scout program is not cumulative. You do not have to start in kindergarten. You can join in high school. You can join as an adult. Any time of year is the right time. You do not have to wait for the fall. To join, click here.